We welcome three new members of staff who have started with us in the past few weeks. Tom and Stuart are based in Mold, where they will increase the services we provide locally and further develop and strengthen our presence in north-east Wales and North West England. We’ve welcomed Wendy Heaton who has started with us as a Project Controller. This role was identified through the analysis we carried out in conjunction with Bangor University and the North Wales Business Academy sessions with the University. We’ve been busy over the last few months with a variety of projects. It’s welcome news that Housing and Regeneration Minister Rebecca Evans plans on reviewing Wales’ affordable housing provision. The review is intended to analyse the potential for increasing match funding as well as examining how partnerships between LAs and Housing Associations are currently working in practice. Many of our longest standing contracts are with Housing Associations. The report is of particular interest as we continue to advise Williams Homes in Bala and Wrexham, who are providing three social housing developments for Grŵp Cynefin Housing Association. Adam has been heavily involved in these contracts. Datrys has been commissioned to provide the civil engineering design of a local community hydro-electric generating plant. Hydro Ogwen is a cooperative venture to harness the power of the Ogwen River in Gwynedd. Bryn Seiont Newydd has been named as the best care home in the UK. Opened last November on the outskirts of Caernarfon, Bryn Seiont Newydd took the top prize in the main category at the prestigious Pinders Healthcare Design Awards 2016. 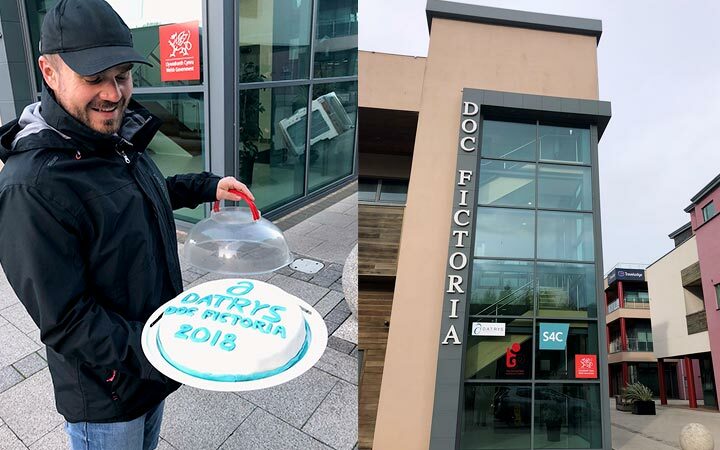 Datrys’ office in Mold recently celebrated the one year anniversary of its opening and twelve months on, the branch is flourishing. Datrys Director, Warren Lewis, who heads up the premises, has been joined by new Graduate Engineering Technician, Sandra Pousadas. Contract staff have also been employed throughout the year to suit demand. Datrys has been employed to carry out the design and project management of the Langwell Hydro scheme in Ullapool in the Scottish Highlands. Datrys continues its aim to grow and strengthen its capabilities with the arrival of four new members of staff. Jonathan Allen is a Graduate Civil Engineer from Swansea University. He will be based in our Caernarfon headquarters and will reinforce the current team of engineers. Our new technicans are Sandra Pousadas and Levente Incze who completed their engineering degrees in the Instituto Politecnico de Setubal, Portugal and the Technical University Cluj-Napoca, Romania respectively.